Laying aside Charles Barr’s excellent English Hitchcock, I pick up Bill Krohn’s Hitchcock At Work and Leonard Leff’s Hitchcock and Selznick, as we enter the second half of Hitchcock Year. Hitchcock even dismissed Rene Ray, who had popped up as a maid in THE MAN WHO KNEW TOO MUCH, and Nova Pilbeam, whom he’d directed twice, even though Selznick was very keen on her. Criterion have very helpfully supplied their splendid DVD of REBECCA with screen tests showing Vivian Leigh, Loretta Young, Margaret Sullavan, Anne Baxter and Joan Fontaine. The deal-breaker seems to be the line “I’m shy,” which sounds very odd coming from Loretta and especially Vivian. Laurence Olivier, already cast as Maxim de Winter, helped his wife by reading with her, but that accentuated the problem: she looks like she wants to leap out of shot and tear his trousers off. It’s strange to hear the same dialogue, which seemed inherently imbued with meaning and nuance when read by all the others, utterly flattened and robbed of all dramatic point. Alma and Joan Harrison, Hitch’s assistant, seem to have preferred Baxter and Sullavan, who are both good — Sullavan isn’t so shy but she’s, as always, fascinating — but somehow Joan Fontaine emerged as the winner despite all sorts of anxieties being raised. Hitchcock would labour fantastically to get the required performance from her, and even in post-production the work continued, with many of her lines being dubbed on afterwards (this sometimes results in noticeable “lip-flap”). Hitchcock had come to Hollywood, with English producer Michael Balcon spluttering “Deserters!” in his wake, before war seemed certain, and signed with David O Selznick (the O stands for nothing) as producer and brother Myron Selznick as agent, unmindful of the obvious potential for conflict of interest in such an arrangement. Plans to make THE TITANIC were soon laid aside and it was decided that Hitch’s first American film would be a story set largely in England, Daphne du Maurier’s best-seller, which Hitch had tried to buy for himself. With JAMAICA INN and later THE BIRDS, Hitch would, shall we say, “freely adapt” DdM’s stories, but Selznick would stand for no liberties, pronouncing himself “shocked beyond words” at Hitch’s first treatment. The documentary HITCHCOCK, SELZNICK AND THE DEATH OF HOLLYWOOD seems to suggest that Hitch had in mind turning Rebecca into one of his British chase thrillers, but in his book Leff suggests that the alterations were not that great. But the first credit of the film calls it a “picturization” of the novel, and that’s exactly what Selznick had in mind — translating the words to the screen as faithfully as possible. Censorship issues and length were the only factors that would convince him to alter anything. This leads us to a central question — whose film is REBECCA? In later years Hitch was happy to ascribe the movie mainly to Selznick, who certainly oversaw the whole thing and approved every major decision. But you can’t direct by remote control, so a considerable amount of Hitchcock also seeps through. The major stylistic tropes are all Hitchcock’s, such as the confession scene, in which Hitch brilliantly avoids the need for flashback by moving the camera through space as if following the action of a scene that happened a year ago. Selznick was careful not to force casting decisions on Hitch, and given his obsessive nature, seems to have behaved as considerately as he could. Those lengthy memos are actually masterpieces of tact, slapping Hitchcock down when Selznick felt he’d missed a vital point or misplayed a moment, but always being careful to include praise and enthusiasm also. Leff praises Selznick for introducing a new depth to Hitchcock’s work. I think he perhaps overstates this, given the emotional intensity of SABOTAGE, for instance, but REBECCA certainly unites this emotional maturity with an unusually sound structure, excellent casting, and of course enormous production values which Hitch could never have dreamed of in Britain. The miniatures of Manderlay, unlike the toy trains and houses of the Gainsborough pictures, are obviously massive and finely detailed, often looking entirely convincing, or else so madly elaborate as to make one doubt they could be specially constructed. “Who’s the chap you married?” asked Larry. “Brian Aherne,” said Joan with pride. “Couldn’t you do better than that?” sneered Olivier. A cigarette in the cold cream. Maxim — conceived by both du Maurier and Hitch as something of a boor, although Selznick seems not to have accepted this — rescues “I” from a life of indentured servitude to the monstrous Mrs Van Hopper (Florence Bates, the driving force behind the early scenes) with a brilliantly unromantic proposition: “I’m asking you to marry me, you little fool.” Not only is his wording questionable, he’s not even in the room with her when he says it. I’m not the most romantic guy, but I flatter myself that I wouldn’t shout a proposition like that through from the bathroom. These early scenes are terrifically effective, with Hitch generating suspense from a romantic peril rather than a physical danger — will Joan get Larry and escape Florence? Of course she does, and then her troubles really start. REBECCA works as a romantic melodrama because it plucks its heroine from a humdrum, oppressive existence, and deposits her in an excitingly terrifying one. At his ancestral home, where he really shouldn’t have returned, Max introduces “I” to the servants, who proceed to make her as uncomfortable as they know how, particularly Mrs Danvers, inimitably played by Judith Anderson with mad staring eyes and fish-faced froideur. The script, credited to Joan Harrison and Robert E Sherwood (WATERLOO BRIDGE — Hitchcock later gave him the lion’s share of credit), with original “adaptation” by Michael Hogan and Philip MacDonald (a prolific Scot who also contributed to THE BODY SNATCHER, BRIDE OF FRANKENSTEIN and THE DARK PAST) does a fine job of balancing Joan’s struggle to reach her distant husband, to master the running of the house and establish her own personality in place of Rebecca’s, and her tentative investigation into Rebecca’s death. Filming was unusually fraught for Hitchcock, unused as he was to the kind of obsessively close supervision Selznick favoured. He would complain of having to summon the producer to the set to get approval of the last rehearsal before shooting it. Labouring with cinematographer George Barnes to create intricate shadows and lighting effects within the imposing sets, Hitchcock took his time, worrying Selznick. Hitchcock had boasted of the efficiency of his “cutting in the camera” approach, so Selznick couldn’t understand why things were taking so long. Of course, Hitchcock may have shot less coverage than average, but he used more angles, and he was dealing with an inexperienced star, and supporting players like Gladys Cooper and C Aubrey Smith had trouble with their lines. One of the many pleasures of REBECCA is its finely calibrated use of humour — Hitchcock found it lacking in this regard, but he managed to incorporate some wit anyway. After Mrs Van Hooper is left at the wayside, the film darkens and deals with the travails of “I” as wife of Maxim and mistress of Manderlay, then gets a blast of comic energy from the entrance of George Sanders, through a window. Sanders, as unspeakable cad Jack Favell, has such fun being a rotter that he could easily derail the film’s Gothic earnestness (a friend of Kurt Vonnegut’s once defined the Gothic formula as “A young girl moves into an old house and gets the pants scared off her,”), but in fact he provides just the right amount of relief, and as the story progresses his blackmail scam, unveiled with much purring smarminess, becomes so vicious and offensive that he’s subsumed into the more serious drama. A word about George — one of those uber-English actors (he was actually Russian) for whom the word “yes” begins with several “m”s. I love him deeply, and regret that he’s only in two Hitchcocks (he’s great fun in next week’s), so it was a pleasure to pick up Brian Aherne’s biography of him, A Dreadful Man. His autobiography, Memoirs of a Professional Cad, is also good value. But it doesn’t give the details, as Aherne does, of the unfortunate financial venture which nearly landed Sanders in trouble with the real authorities, a shady business in which Sanders was a senior partner, although he denied being aware of any of the details when the sorry affair came to court. The name of the company? Cadco. Now, George’s casting in REBECCA, as a car salesman, invites one to ponder who would buy a used car from George Sanders, but really, who would buy shares in a company run by George Sanders, especially one called Cadco? You can see your hand through it. George’s entrance lifts the mood and injects fresh intrigue, providing contrast with Mrs Danvers’ big scene in Rebecca’s bedroom, where she shows “I” around, waxing lyrical over the translucent nightie. Hitchcock introduced the brilliant and scary idea of the mimed hair-brushing, the kind of touch Selznick was able to accept. This is a tough scene to write about because it’s all been said, really. But I think DOS’s addition of a freeze-frame on Danvers at the end is a very productorial kind of mistake. Hands-on guys like Selznick love to make the material do things it wasn’t designed to do, and in extreme cases you get something like the infamous “Love Conquers All” cut of Terry Gilliam’s BRAZIL, assembled by Universal boss Sid Scheinberg. Selznick obviously wanted to extend the shot, whereas Hitch intended to end the scene as soon as Joan leaves, obeying the rule that she’s our eyes and ears at this point of the film and we can’t be anywhere without her. Danvers’s famous trick of entering and leaving a scene unseen — like Wodehouse’s Jeeves, who “sort of shimmered, and was gone,” — is really a result of Hitchcock’s adherence to POV. He abandons the dramatic tension of showing Danvers enter, unnoticed by “I,” in favour of making us share the heroine’s shock at the sudden arrival. Truffaut: “It’s an interesting approach that is sometimes used in animated cartoons. Selznick’s freeze-frame is very obvious, but this wasn’t a period when such things were done for effect. Hitchcock would have dismissed the freeze as distracting, whereas Selznick, having seized upon it as a way to make the footage do what he wanted, was blind to its technical inadequacy. This might also account for some of the bad dubbing. Enjoying the film with me, Fiona nevertheless asked, with some justification, how it was that Mrs Danvers (“Danny” to her friends) managed to keep her job after going all weird here, then tricking Joan into wearing the upsetting dress, and then trying to talk her into defenestrating herself to death. Narrative pace is the filmmakers’ best defense against such plausibilist arguments. You thought that I loved Rebecca? You thought that? I hated her! Wrong and wrong: the body was discovered two months later, not two miles away, making it less of a coincidence. And the script is quite clear that there was an inquest. Maxim and Rebecca had presented such a convincing sham of a happy marriage that no awkward questions were asked. Stiff and, as David Mamet has said, “grudging” in his performance, Olivier is nevertheless quite effective here. Maxim is a romantic, tortured hero in the Mr Rochester mold, but without the humour — this plays to Olivier’s weaknesses, turning them into strengths. The confession scene gives him something to really get his teeth into: you need a stage-trained actor for sustained scenes like this. Maxim confesses all to “I” in the boathouse, Hitchcock’s strongest bit of personalized storytelling. As a sop to the censor, Maxim is no longer guilty of murder, as in the novel, but of concealing a death. Provoked horribly by his sinful wife (his hyperbolic descriptions of how wicked she was seem unreliable, but we’ll later find out he’s quite right) he hits her, and then she trips and bangs her head and dies. Not his fault at all. For any alert viewer, Maxim is actually more guilty in the film than the book, since at least in the book he admits everything. Still, Selznick and Hitch evidently want us to accept his version of events, since from his confession onwards, Maxim becomes co-protagonist, meaning that Hitchcock can shoot scenes in which Olivier is present and Fontaine is not. This allows him to accelerate the pace, cutting back and forth between Larry and Joan’s separate adventures, with Joan in jeopardy from a now-clearly-barmy Mrs D (I wonder what the deal is with Mister Danvers?) 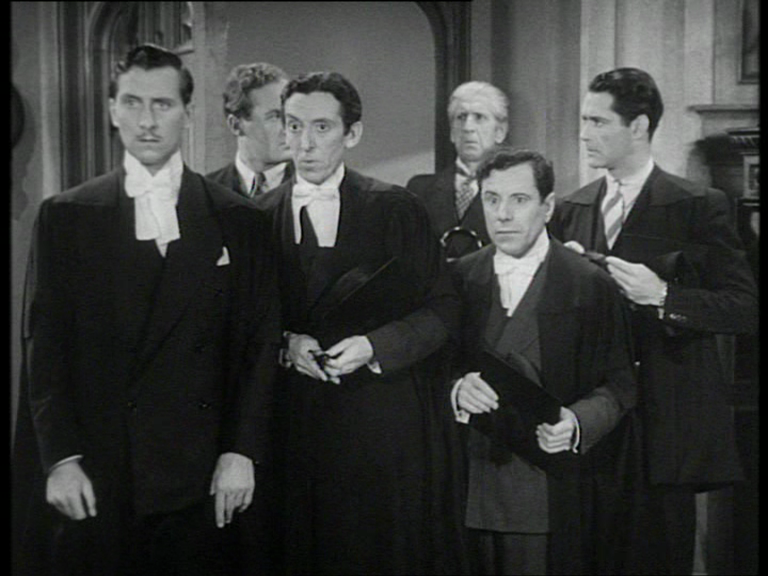 as Larry clears up his blackmail/legal difficulties by speaking to Rebecca’s secret London physician, played by Leo G Carroll, from now on a Hitchcock favourite. Hitchcock’s most successful films must always find a way to exploit the subjective effects which are his speciality. Here we have Fontaine as the audience’s eyes and ears for two-thirds of the story, with that role divided between her and Olivier at the end. There is one scene, involving Australian character actor and former silent comic Billy Bevan as a police constable, which is purely expository and involves neither one of them, and I feel it’s a bit of a miscalculation, although it’s brief and I always welcome Bevan in faux-cockney mode. I’m afraid there’ll have to be another inquest. At this point Fiona identified a curious inconsistency: Mrs Danvers tells us that she served Rebecca since she was a bride, and then that Rebecca had a doctor in London whom she had seen secretly even before her wedding. Yet the pseudonym used by Rebecca deWinter at the doctor’s was “Mrs Danvers.” This is odd since, at the start of her visits, when she was single, she presumably had never met Mrs Danvers. Presumably… Perhaps it’s just an intriguing inconsistency to hint at further, unrevealed truths, perhaps involving “Danny” and Rebecca having been acquainted in secret at an earlier date than officially admitted. That du Maurier lesbian subtext is looming larger. “I knew the character was meant to be something of a lesbian,” says Dame Judith in interview, “Not that I knew very much about lesbians then. Indeed, I still don’t.” As if butter wouldn’t melt in her mouth. According to Hitchcock, his battles with Selznick extended even to the closing shot. The producer purportedly wanted smoke from the blazing Manderlay to form a letter “R” in the sky. “Can you imagine?” Hitch asked Peter Bogdanovitch, wide-eyed in mock-horror. Hitch’s solution, the burning of the monogrammed negligee-case on Rebecca’s pillow, is of course more tasteful, (and anticipates CITIZEN KANE) but it’s also planted by that object’s inclusion in the dialogue earlier. Author Leonard Leff is very big on Hitch’s use of objects to express emotion. He also believes that Hitch learned a lot from Selznick, which is a more debatable point. I think having a producer challenge his ideas was useful to Hitch. I’m not sure Selznick’s power of total veto was so positive. But the creative tension undoubtedly produced something memorable with REBECCA. Selznick allowed some slight departure from the novel (which Fiona’s read) in sparing Maxim a blinding (Mr Rochester-style) in the fire. I guess since he’s no longer guilty of murder he’s no longer deserving of such punishment. The unscathed lovers embrace, having gone through a psychological opening-up that looks forward to the analytical drama of SPELLBOUND and MARNIE. The past cleansed by fire.